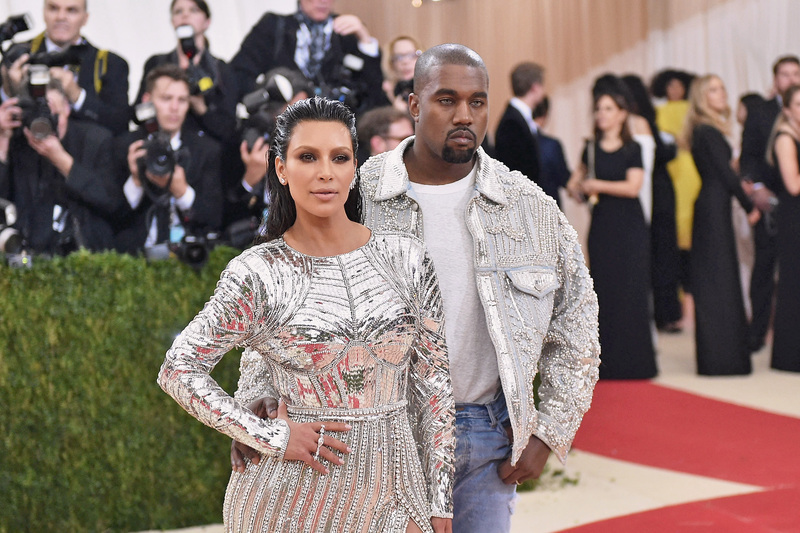 Breaking Kanye West news — and isn't that your favorite kind of news? Same. The never-boring West premiered the video for his The Life of Pablo track "Famous" for both a massive group of fans at the LA Forum and viewers streaming the show on Tidal Friday night, and it's already dominating headlines thanks to its subject matter: It features 12 extremely famous celebrities (aka, George Bush, Anna Wintour, Donald Trump, Rihanna, Chris Brown, Taylor Swift, Kanye himself, Kim Kardashian West, Ray J, Amber Rose, Caitlyn Jenner, and Bill Cosby) very naked and asleep in bed together. Considering how real the celebrities featured look, the question the video begs is, naturally, were the people in Kanye West's "Famous" video real? Let's start by getting this awkward fact out of the way: There's no clear evidence if the celebs are real or not, and that's intentional. Vanity Fair, who got the exclusive on the video, described Kanye West as being "loath to divulge too much of what went on behind the curtain. For him, the ambiguity goes to the core of what he’s trying to say about the mythos of contemporary celebrity." Fair enough. The piece wouldn't have been half as powerful if you could tell who was real and who wasn't. However, the same article does reveal the video was created "over a period of three months and cycled through four different formats and several different collaborators until West felt he’d achieved the result he wanted," which does suggest that some "collaborators" may have been there. Additionally, when you watch the video, the wax-mannequin argument doesn't seem convincing for every body, since you can see some of the sleepers breathing. The image is inspired by and closely imitates contemporary painter Vincent Desidero's Sleep, but executing the idea in video instead of paint has made all the difference here. West has used handheld camera-style footage to obscure who's real and who isn't, so visual evidence is only going to get us so far. Let's add in a little extra logic. Starting with the most obvious: Kanye West? That's definitely him, right? It's his project and I'd be surprised if he didn't want to physically appear in it. As for the rest of the celebs — it's not clear either way, and likely won't be unless West or the celebs themselves actually speak out about any involvement. (Though, it is worth noting that, according to TMZ, Donald Trump's rep has denied it was him in the video.) If I was a bettin' gal, I'd put my money on West and Kardashian actually being present, but the others really can't really be figured out. Of course, given the entertainment industry and the way stars have of spilling secrets, I'm sure it won't be long before we have an official statement on the video from one or more of the fans above. Until then? We'll just have to wait and see.